“This year I was delighted to be selected by the School of Law to participate in a three-month legal externship in Los Angeles, California. My time was split between the Los Angeles Superior Courts and Federal District Court (for the Central District of California). I spent two weeks in the Superior Courts and ten weeks in the Federal District Court. The Irish American Bar Association (IABA) and the University of Limerick School of Law generously sponsor the programme. Four other law students from UCC, TCD, UCD and QUB also participated in the externship. The IABA helped to organise accommodation and acted as a sponsor and guide throughout the visa process and during the externship. The members of the IABA, our host families, the judiciary and our sponsor Mary O’Neill were overwhelmingly hospitable throughout our stay. To learn more about the international opportunities for School of Law students, please visit https://ulsites.ul.ie/law/node/17921. 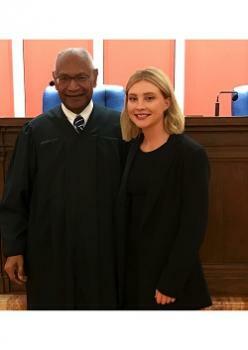 Zara Murphy pictured with the Honorable Terry J. Hatter Jr, Federal District Court Judge for the Central District of California.